My girl Ellie rocks (even though she does a lousy job of keeping up her blog). This morning was the all-star swim meet featuring 12 swimmers with the best times in every event from each of the Virginia Beach Swim League’s six divisions. Ellie was the 6th seed in 25 free, swimming in the second, faster heat. Earlier this week, Ellie’s coaches noticed that she’s been leaning to the left before she dives, which pushed her too deep into the water, and worked to correct it. Her Nonnie (my mom) also talked to her about uncorking something extra toward the end of races. Between the technical and inspirational advice, it worked. Ellie jammed in her heat, diving well and going hard all the way into the wall to take 3rd place. She carved three-quarters of a second off her previous best time to swim in 16.17, which also broke our swim club record for 10-and-under girls. (And in the very last meet she could do it.) Ellie had been gunning for that record and finally got it. You should have seen the smile on her face. She also swam strongly in the 100-free girls relay, which finished second as seeded. The quartet lowered the record they’ve broken four times this year by more than a second to 1:07.43. How cool is that? For many cyclists Saturday is the day to get up early and ride long and hard with your favorite group of local hammerheads, but not in the summertime for me. Most summer Saturdays are for my daughters’ swim meets. I still get up early, but we must hurry off to our own pool or someone else’s for five hours of sizzling in the sun as heat after heat of kids swim for blue, red, white and countless other ribbons. I’ve been lucky enough to be able to ride to three of the away meets so far, but the 17- to 20-mile spins make it more of a rest day to me. Fortunately I love to watch Ellie and Millie compete. Ellie is one of the top swimmers in our local division in the 25 free and her 100-free girls relay team is superstrong, lowering our club record three times this year. Millie emerged as the fastest 5-year-old as well in both the freestyle and the back – amazing because she could barely swim a length of the pool when the summer began. Soon my Saturday mornings will be for riding again, not just rest or spinning days. At least until soccer begins. 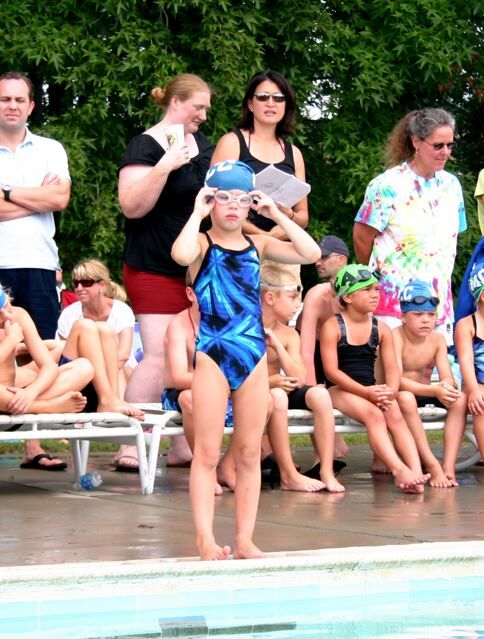 My Millie had a breakthrough swim meet on Saturday. She carved 7 seconds off her 25-meter freestyle, swimming it in just over 39 seconds, and finishing 7th in the 6-and-unders. Then she lopped 8 seconds off her 25-meter backstroke, finishing in 5th place with a time of just over 42 seconds. She was the fastest 5-year-old in both strokes. She also swam her mixed relay team into a solid 4th place. Not bad for her third meet. I think we’ve got another swimmer on our hands. Ellie swam in two relays that got 1st and swam to two 2nds in the 25-free and 25-breast, but was disappointed that she didn’t improve her times. She also didn’t have a good butterfly. She’s been working on the stroke with her coaches and one remarked she swam with her head and not her body. Still I think her ribbon haul was pretty good. 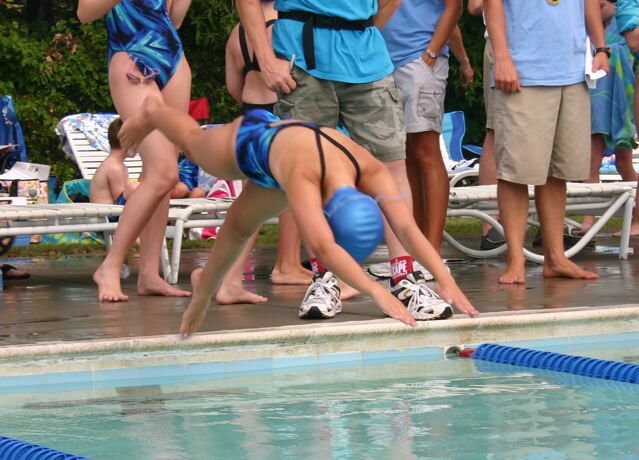 The photo above is her start for the breast stroke. The girls swam another great meet on Saturday. Ellie swam a 50-meter breast against 12-and-under girls (she’s 10) and managed 4th place. It was cool to see her do so well against the older girls. Millie carved three seconds off 25-meter free for another 11th place and then swam her first 25-meter backstroke and came in 7th (the fastest 5-year-old in the 6-and-unders)! Wow. On Sunday, we gathered a crew of dirt riders and hit Wahrani in New Kent County for some laps so I could try out my new Trek Top Fuel. I spent most of the time chasing Jerry, Kevin and a strong Rob through the woods. The bike took a little getting used to, but not much. I need to firm up the rear suspension a bit and replace the old Race Face crankset, which is too worn out. I definitely am happy with it. It rode nicely and I felt like I could keep going and going on it. Can’t wait to race it Sunday at Camp Hilbert. After a year of knocking on the door, Ellie broke a swimming record at our club. She’s been close to the 25-free time since last summer, but she put her name on the board thanks to a relay. She and three other 10-and-under girls rocked a 100-free relay in 1:10.09 on Saturday. That time knocked a quarter second off a 9-year-old club record held by the daughter of our head coach. This group of girls has the potential to carve more time off that record. All four swim sub-18 second 25s and Ellie and another girl are both close to going sub-17. Millie also swam her first swim meet on Saturday. She swam the first leg on a 100-free mixed relay that was in fourth until the boy swimming the anchor leg refused to swim and they were disqualified. Then she swam a 25-free in 49 seconds, winning her heat and coming in 11th overall, which was awesome. Unfortunately Audrey needed to go potty right then, so I missed her swim. I was bummed, yet thrilled that she did so well. Ellie had another strong swim meet, cutting a few more tenths of a second off her 50 free and almost winning that race. More significantly she swam a real strong 100 IM, but let her tell you about it. Unfortunately, the meet was taking so long that she had to skip the 50 butterfly, her strongest stroke, to make U11 advanced squad’s first soccer game of the year. As it is, she left the pool after the IM, jumped in the car and still didn’t arrive until after the game started. I’m the idiot; Ellie is most excellent. Despite feeling more than a little under the weather, I woke early Sunday morning, got all my stuff together, loaded the K2 with the new Fox fork atop the car and headed up to Freedom Park in Williamsburg where a bunch of folks were gathering to ride. I got all the way to the exit when I realized I forgot to pack my shoes. I blame it on medicine head (and my innate idiocy). At least I got a Trader Joe’s run in. Someone in my family had a rocking weekend, however. Ellie had a swim meet in Hampton and scored two second places in the 50-meter freestyle and butterfly. She also cut about two seconds off her freestyle time, down to just over 37 seconds. Such results make me really proud of what a competitor she’s become. She’s often racing against girls who train four or more days a week, while she swims twice in a good week with her busy schedule.